G'day! Here is a beautiful cover that I received from England yesterday. The first stamp on the left of this lovely cover belongs to the “Fishing Industry” Series, issued on 23th September 1981. 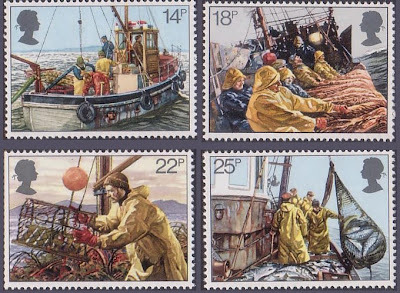 The set of four stamps depict Cockle-dredging from Linsey (14p), Hauling Trawl Net (18p), Lobster Potting (22p) and Hoisting Seine Net (25p). The top right stamp on the cover is part of 4 stamps commemorating the 100th Anniversary of The Linnean Society on 19th January 1988. The Linnean Society of London is the world’s premier society for the study and dissemination of taxonomy and natural history. 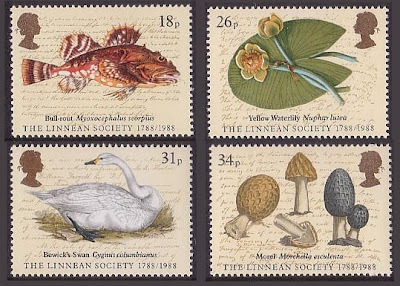 The stamps depict Short-spined Seascorpian (18p), Yellow Waterlily (26p), Whistling Swan (31p) and Morchella esculenta (34p). 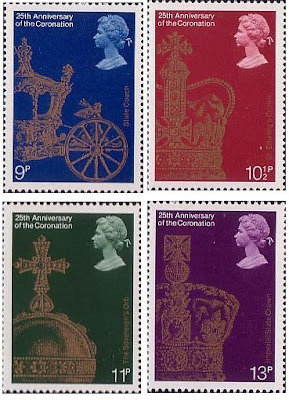 The middle left stamp is from the "25th anniversary of the Queen’s Coronation" series, designed by Jeffery Matthews. This issue was released on 31st May 1978. The coronation Regalia was the subject chosen to celebrate the 25th Anniversary of Queen Elizabeth’s Coronation. The State Coach, depicted on the 9p value, was completed in 1762 for George III and has been used for each coronation since George IV. It is gilded throughout and eight palm trees form its framework, with the roof surmounted with cherubs holding the Royal Crown. The St. Edwards Crown, depicted on the 10 1/2p, is worn by the sovereign only during the coronation ceremony. Made in 1661 for Charles II, it is set with diamonds, emeralds, rubies, sapphires and pearls with a jeweled cross on the top. The Sovereigns Orb, depicted on the 11p, is a globe of gold circled with a band of precious stones with a great amethyst set beneath a jeweled cross, symbolizing the world dominated by the emblem of Christianity. The imperial crow, depicted on the 13p, is worn for state occasions and was originally made for the Coronation of Queen Victoria. It’s delicate framework is encrusted with diamonds and precious stones which include the Black Prince’s Ruby, the Stuart Sapphire and drop pearls known as Queen Elizabeth’s Ear-rings. Next, is a stamp from the “Christmas – It’s Magic” Series, issued on 17th November 1987. The 5 beautiful stamps in the set depict 'Decorating the Christmas tree' (13p), 'Waiting for Father Christmas' (18p), 'Sleeping child and Father Christmas in Sleigh' (26p), 'Child reading' (31p) and 'Child playing flute and Snowman Christmas' (34p) respectively. The Old English sheepdog depicted on the 9p value stamp (bottom left) is part of the “Dogs” Series, issued on 7th February 1979. 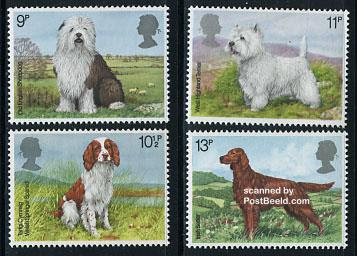 The other 3 stamps show a Welsh Springer Spaniel (10 ½ p), a West Highland Terrier (11p) and Irish Settler (13p). 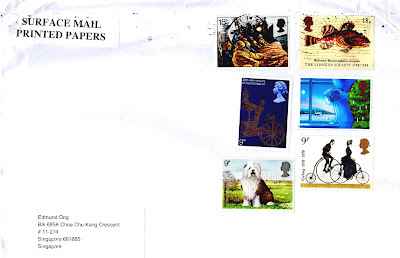 Last but not least, on the bottom right is a stamp from the “Cycling” Series, issued on 2rd August 1978. 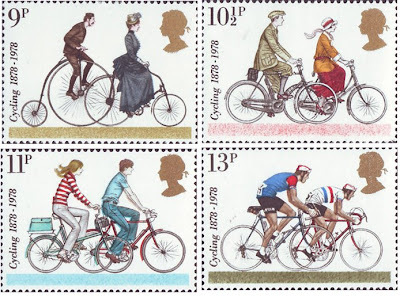 The stamps feature Penny-farthing and 1884 Safety Bicycle (9p), 1920 Touring Bicycles (10½p), Modern Small-wheel Bicycles (11p) and 1978 Road-racers (13p).